To make the meringues, whisk the egg whites at medium speed using an electric hand mixer until they form soft peaks. Add the caster sugar one spoon at a time and continue to whisk at high speed. The meringue should be smooth and glossy. Fold in the icing sugar one third at a time. Add the lemon extract and combine gently. Using a large spoon, form 6 small meringue nests on a lined baking tray. Bake at 100 degrees in a fan oven for 1 hour to 1 hour 15 minutes, until the meringues are firm. Leave the meringues to cool. Using a fork, mash a few of the kiwi berries gently to make puree. 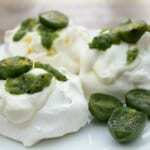 Spoon creme fraiche onto each meringue nest, followed by a little of the kiwi berry puree. To finish, slice a kiwi berry in half for each meringue and place on top. Add lemon zest on top of each to serve.